Explore some of the West’s best-known attractions when you land in the Equality State for FMCA’s next international convention. This July, FMCA’s “Wanted In Wyoming” International Convention and RV Expo will ride into the small city of Gillette. And within short order, RVers in an assortment of “covered wagons” will get acquainted or reconnect with each other. They will attend seminars, shop for RV-related merchandise, and take in fabulous daytime and evening entertainment. It promises to be legendary! The shindig, slated for July 18-21, will be the second time FMCA has set up camp at Gillette’s 1,100-acre Cam-Plex Multi-Event Facilities. This venue accommodates thousands of RVs and has a number of campgrounds with hookups. Details and registration information can be found at FMCA.com, or on the form located on page 71 of this issue. Buckaroos can get their early-bird registration in now (through May 23, 2018) to save some bucks. Following are some attractions you may want to explore while in northeast Wyoming for the convention. Have a look and you’ll agree this is definitely worth adding some days to your trip just so you don’t miss out. Gillette, population 32,000, was named after Edward Gillette, a land surveyor for the Chicago, Burlington, and Quincy Railroad. Today, many area residents earn a living from the energy industry, extracting oil, gas, or coal. Coal is Gillette’s main export, and Wyoming produces 35 percent of all the coal in the United States. So, as you might guess, one of the top things to do in town is a . . .
Coal mine tour. Although that old tune about working in a coal mine may come to mind, the folks at the Gillette Visitors Center assure us that visitors are not asked to swing a pick. The visitors center is the starting spot for this $5, two-hour tour to the local coal mine and overlook. It’s a fascinating way to learn about the history of the town and how coal is extracted and used. Campbell County Rockpile Museum. 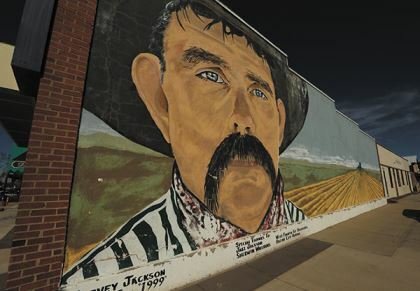 Situated next to a naturally occurring rock formation, this free local history museum has fossils, American Indian artifacts, historical photos, and plenty of antique vehicles, guns, saddles, quilts, and other items. Downtown sights and sites. History fans will enjoy a walking tour of downtown, using a booklet provided by the visitors center or by downloading the TravelStorys smartphone app — both free — to learn more about how Gillette came to be. 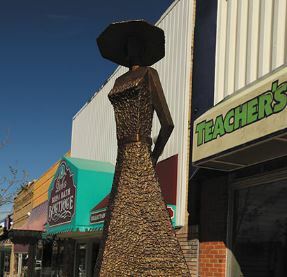 Another reason to explore downtown is to see more than 40 public sculptures. Plus, interesting emporiums, such as Magpie Designs at 219 S. Gillette Ave., can be perused. This store is the entryway to the town’s famous 1911 Jail Cell, which still has a bullet hole in the door! Frontier Auto Museum. 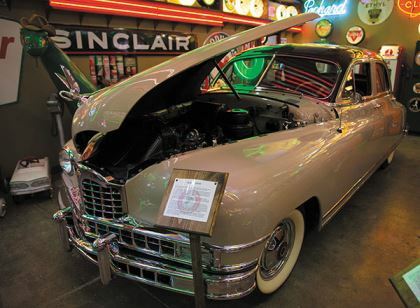 This bright and impressive collection features restored autos and related transportation memorabilia such as oil signs and gas pumps. An antiques and relics store and a little coffee shop are on-site as well. Check their library of vintage materials that you can read as you sip. Admission is $8 for adults, $5 for seniors and military, and $5 each for groups of five or more. Visit www.frontierautomuseum.com or call (307) 686-5667. Bison Ranch Tour. Durham Ranch, just outside Gillette, opens its gates to the public on Tuesdays and Fridays, when a tour is offered from 10:00 a.m. to noon. 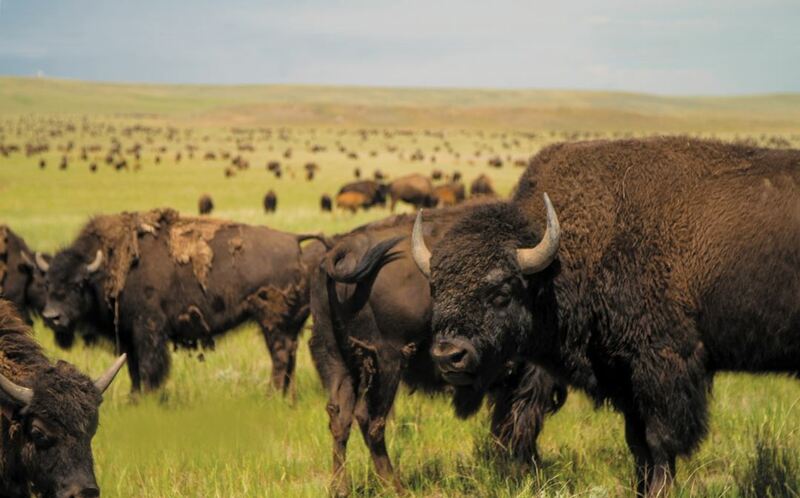 For $55 per family, $25 per adult, or $10 per child, you can ride around on this 55,000-acre ranch that has 3,000 bison, give or take a few. Take photos, and learn about the proper stewardship of these national treasures. The Bisom Bison gift shop offers a variety of bison products, from jewelry and clothing to home décor and meat items. Participants provide their own transportation to the ranch, but tour reservations are made through the Gillette Visitors Center. The Gillette Visitors Center has more info about tours and sights. Call (307) 686-0040; www.visitgillettewright.com. Western food usually means thick steaks and flavorful Southwestern fare, and that’s exactly what Gillette’s most popular restaurants provide. Los Compadres is said to be a consistently good Mexican food spot, and The Prime Rib Restaurant & Wine Cellar has been rated “outstanding” by online reviewers. Other top-rated spots include the Rib & Chop House, Jo-Bawb’s BBQ, The Coop Rotisserie House (for chicken and more), and K’s Koffee & Deli. This small town also has Chinese food, pizza, and several chain restaurants. For more ideas, visit the Gillette website, www.visitgillettewright.com, and click on Plan Your Stay and then on Dining. Also, search online review sources. Many iconic Western sights are easy to reach as part of a day trip from Gillette. Following are spots you can plan to see, with the driving time and the distance from Gillette listed. Scientists say the tower is a stock — an intrusive body formed by magma that cooled underground and was later exposed by erosion. Visitors can hike around the area on the paved, 1.3-mile Tower Trail, which has interpretive signs and benches upon which to rest. Or, choose a longer trail. One loop takes you to a nearby prairie dog town. Vehicle passes for up to 7 days are $20, or use your national parks pass (a variety of these passes is available online and at national parks). Interagency passes are also accepted. Pets are not allowed on any trails in the monument; however, the visitors center parking area, picnic area, and campground are open to pets. More information: www.nps.gov/deto; (307) 467-5283. Besides free admission (parking is $10), Mount Rushmore has a fine visitors center where you can watch a short video about why and how this mountain was carved. To get closer to the sculpture, walk the Presidential Trail (422 stairs, weather permitting). Ranger-led programs are available, too. The ranger-led Evening Lighting Ceremony, held nightly at 9:00 in the summer, stirs visitors’ patriotism. 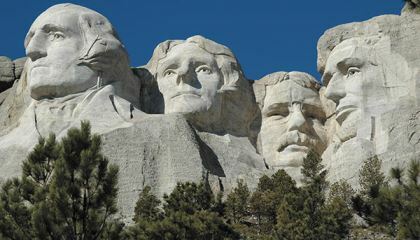 Mount Rushmore’s parking pass can be used again anytime during the year. For more info, visit www.nps.gov/moru or call (605) 574-2523. This has been a work in progress for more than 50 years. The site includes a museum, welcome center, views of the sculpture, and options to get even closer to the mountain by way of a van ride. The memorial depicts a Sioux Indian chief, but it’s meant to honor all American Indians. Admission is $30 per full car; $24 for a vehicle with two people; $12 per vehicle with one person. Additional fees apply to van rides. Visit www.crazyhorsememorial.org or call (605) 673-4681. 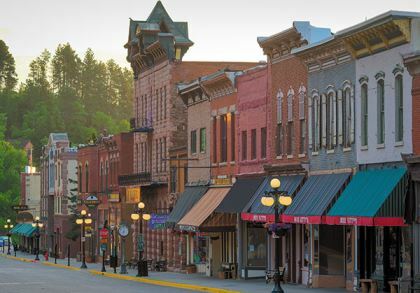 Gold-Rush-era saloons, action-packed street fights, casinos, and the final resting place of Calamity Jane and Wild Bill Hickok are just a few of Deadwood’s lures. On top of all that, the town’s biggest fest starts just a few days after the FMCA convention ends. Deadwood’s “Days of ’76” runs Tuesday, July 24, through Saturday, July 28. It includes two parades and nightly sanctioned PRCA Rodeo events. 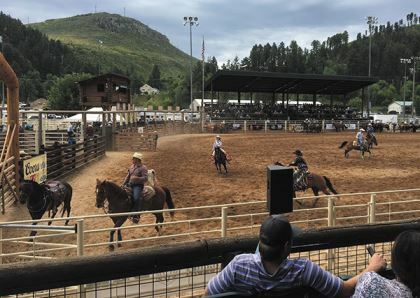 Check the full rodeo schedule, plus other events and attractions, at www.deadwood.com or call (605) 578-1876. The third longest cave in the world, Jewel Cave offers low-cost cave tours that vary in intensity. Choose a 20-minute cave visit that requires very little walking (wheelchair accessible) or a strenuous tour that involves climbing and squeezing one’s way through small passages. 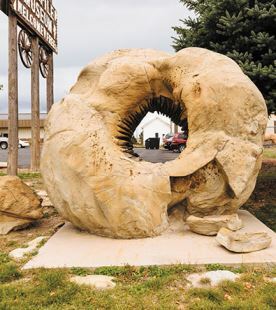 Aboveground, visitors can be captivated by the antics of prairie dogs and other critters. For more information, contact www.nps.gov/jeca; (605) 673-8300. If you have the time, this area offers plenty more to see. Be sure to visit both the Wyoming and the South Dakota state travel websites to see what’s available. And whatever you do, get to Gillette, where you will be “wanted” — wanted for having plenty of Western fun! 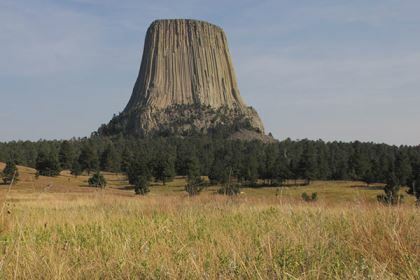 These RV parks are within 35 miles of Gillette, or located between Gillette and Devils Tower. This list may not be complete, and more campgrounds can be found farther from town. For more listings, check your campground directory or the RV Marketplace, published on FMCA.com and in the January issue of FMC for more listings.